Day 280 was the last day of the Magical Mystery Tour. The last day for me to achieve what I'd hoped to achieve during my four-day Phish run. My friend Liz, who had come to town for a show with her husband Nick, had proposed the idea via text message, "Why don't you make and sell lot food?" What a damn fine idea, Liz. 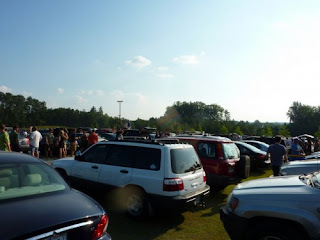 "Lot food" simply refers to food (anything from burritos, quesadillas, hot dogs, peanut butter and jelly sandwiches) that hippies sell in the parking lot ahead of, and following, a Phish concert. Many people who sell lot food are "on tour," and the money they make is how they afford to move from one show to the next. 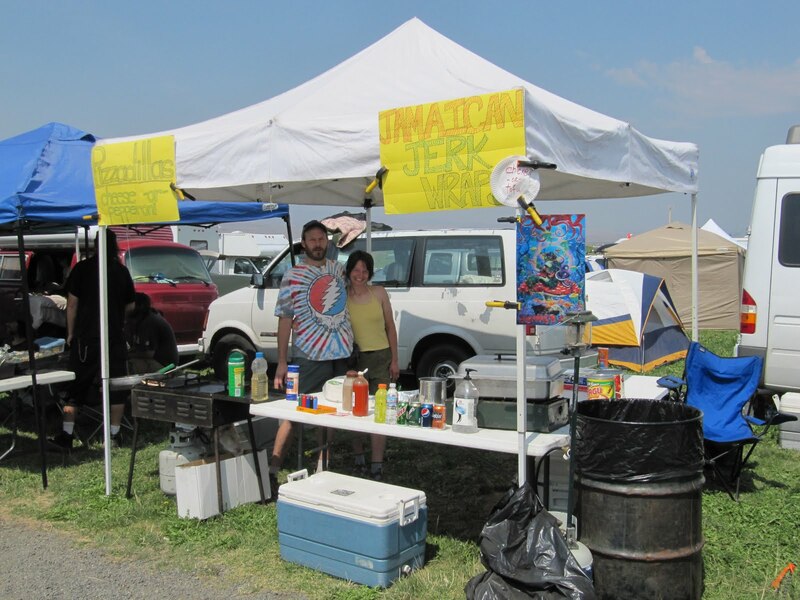 The thought of eating concoctions made by strangers might weird people out, but I think "lot food" is one of the greatest elements of the Phish experience. When Liz proposed the idea, I think she imagined me buying the ingredients and selling my own lot food. But I was not at all interested in doing that. I had been travelling for several days and didn't have the time to get it together. Plus, my plans were so up in the air at that point, I didn't even know if I'd have my own car, or who I'd be going to the concert with. In my mind, I would simply introduce myself to someone already selling food in the lot and offer to help them. I'm extremely charming when I want to be, plus I'm a good cook. I would be a valuable asset to any lot food operation. Or at least I thought so. As I was leaving the concert on Day 279, Emily and I went in search of someone I could assist. I didn't have to look very hard. Immediately I saw a guy standing behind a charcoal grill in the middle of the pathway. He was surrounded by hungry concert-goers and was telling them that what he was selling was, "Vegan sausage dogs." So Phish-friendly! Immediately I noticed that this grill had clearly been fired up for a while. Some of the hot dogs were already cooked, meaning this guy must've left the concert long before it was over. He certainly didn't wander back to his car after the show like we had. This operation had long been underway. I felt awkward approaching him, but I had to. I was running out of days, out of opportunities. But he was clearly in the zone, if there is such a thing as it pertains to selling lot food. 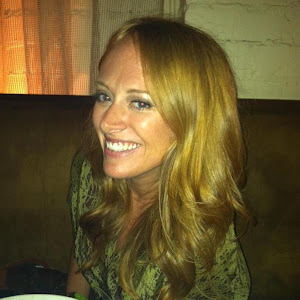 "Hey," I said, timidly, "Can I ask you something?" He didn't look at me, but instead eyed the crowd for his next potential buyer. "Yeah, but make it fast, I've got work to do," he snapped, using tongs to turn the vegan sausage dogs on the grill. Emily and I looked at each other, surprised by his reaction. 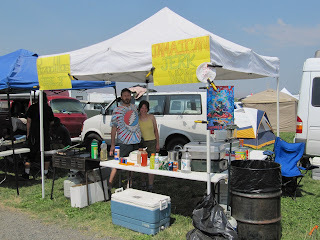 What happened to the fun-loving, laid-back, friendly hippies that used to sell food in lots? This guy was mean. For him, this was it, survival of the fittest. Like he was a challenger on an episode of the Apprentice. In case anyone was concerned about the state of capitalism in America, there is no need to. It is alive and well in Phish lots. There was a part of me that thought maybe this guy thought I was just being ridiculous, or mocking him, or that I might slow down his operation. Regardless, he made it very clear that he wasn't interested in my help. Or in talking to me. Or in breathing the same air as me. I walked away, in the direction of the Zingo driver, feeling defeated. Who knew finding a hippie that would let me make lot food with him would be such a challenge? On my walk, I found another guy selling food. He seemed much more relaxed, and friendly; he happily gave me the information I was seeking. Yes, this food (veggie burritos) was his livelihood. He'd been on tour all summer long. Yes, he wakes up early to prepare the ingredients and leaves the concerts early to get his station set up and ready for business. Yes, he'd let me come help him the next day. He even gave me his phone number. So on Day 280, I called him, thinking that could be thing things I'd never done before. He didn't answer, sending Liz's idea up in flames. But not because I didn't try. Have no fear, though, something I've never seen before happened before the day really even got started. Day 280's thing I've never done before was to see someone get iced. The phrase, "getting iced," was, until late in the summer, foreign to me. But once I heard about it from FF, who heard about it from his summer interns, I couldn't stop hearing about it. On television, on Facebook, on the radio. I overheard my drunk summer intern discussing it, and eventually Mountain Man revealed he had been icing his friends and had been getting iced all summer. I was eternally grateful to everyone who shared what they knew about icing since I was so late to the game. But I couldn't help but think how sad it is to get older. I'm no longer doing the "cool things that kids are doing," I'm hearing about them months after the fact from all of the young, cool interns. For the final Phish day, I met Paul and Bronson at Bronson's house so that we could catch a cab up to Alpharetta together. As we were trying to pack up all of our stuff, one of Bronson's sister's friends, who was staying behind, offered him her backpack cooler to take to the concert. "There might be stuff in it," she said, "But you can just take it out and fill it with whatever." Bronson unzipped the backpack cooler to reveal one lonely Smirnoff Ice. The girl who had tricked him into finding it raised her arms in victory and started laughing. Once we all saw the Smirnoff and understood what had just happened, everyone erupted into laughter and applause. 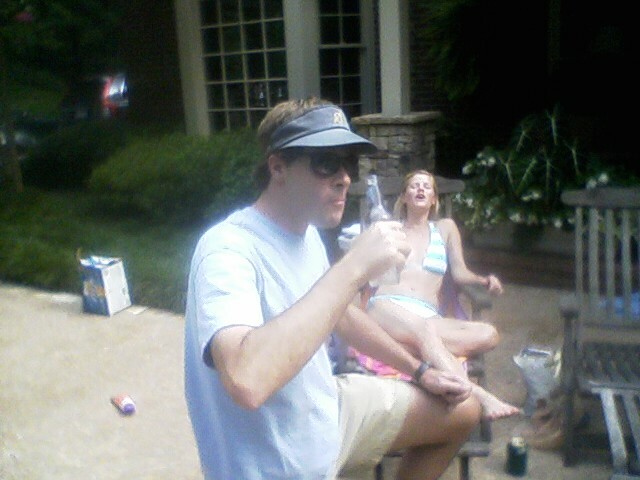 Bronson got down on one knee and chugged an entire bottle of Smirnoff Ice. This is the game that is sweeping the nation. It's what all the cool kids are doing. Icing. 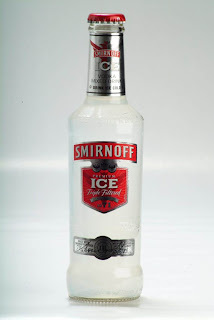 One of the players "Ices" another by either presenting him with a Smirnoff Ice or hiding a Smirnoff Ice and having the other player find it. 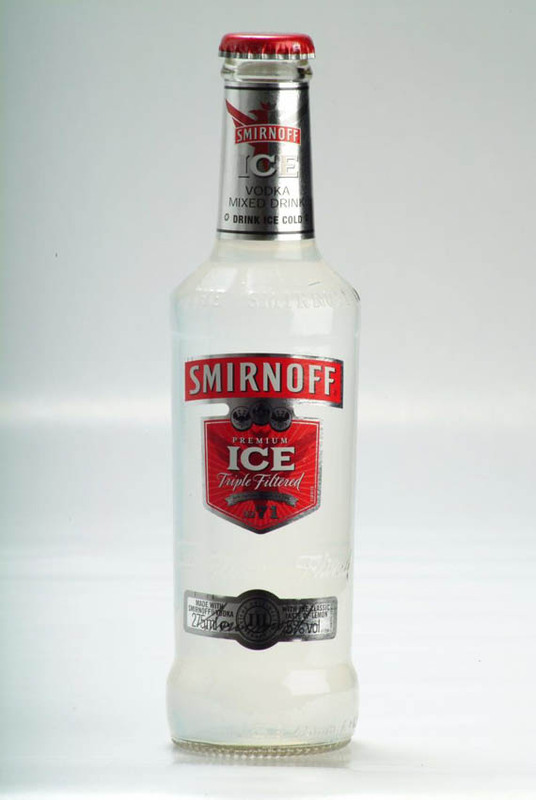 The other player can perform an "Ice Block" by grabbing a Smirnoff Ice within arms reach (e.g. on his person, on a table). Once he presents this "Ice Block" to the original player, the original player must drink both the Smirnoff Ice he presented in the first place and the "Ice Block". If an "Ice Block" is not performed, the player who was "Iced" must get on one knee and chug the entire bottle. However you can not "Ice Block" and "Ice Block". Refusal to do so results in excommunication, meaning that that player can no longer "Ice" anyone or get "Iced." There is no exception to the rule. If you refuse to consume the ICE on the spot you are banned for life unless the territory allows you back in the game (usually a form of initiation will be involved). Bronson took it like a man, and he drank that Smirnoff Ice like he'd been doing it his whole life. I both delighted in seeing this mysterious activity happen in my presence (maybe I'm not as old as I thought) and feared that now that Pandora's Box had been opened, I might be icing all summer.